Round and round we go, getting slammed back to reset, waiting for Tom Cruise to sprint through enough time-loop cycles to figure out how to kiss Emily Blunt amid the wreckage, exo-suits, and tarantula aliens. “Edge of Tomorrow” is big fun. The title’s a soap opera, but “Edge of Tomorrow” just might do for Emily Blunt what “Hunger Games” did for Jennifer Lawrence, while Mr. Cruise inexorably extends his over-the-top-successful body of work. Well, it’s summertime, folks. What happens in summertime? You know. Aliens attack. This is how United States humans have decided they like to spend the warm-weather months—watching aliens try to invade us but we don’t let them. Out of the blocks, Tom Cruise’s Major Bill Cage is just the sniveling type to allow aliens to invade. Having lost his advertising agency, he’s now a desk-jockeying U.S. Army PR officer. Slick as all get-out and can’t stand the sight of blood. Call him Major major-wimp. But aliens do invade. He wants no part of it. His job, for a time, is to publicly champion special-forces soldier Rita Vrataski (Emily Blunt), who’s had success destroying aliens by using the military’s newfangled war-fighting gizmo. But then much to his horror, Major Cage gets assigned to combat. General Brigham (Brendan Gleeson) wants to embed Cage at the tip of the spear. Trying to weasel out of it by threat of blackmail, Cage gets arrested, KO’d, and handcuffed in Heathrow airport, at the mercy of Bill Paxton’s very authentic (and very funny) army sergeant, and the predatory bad-boy misfit outfit “J-Squad.” They’re a merciless crew. Before you can say “futuristic mechanized army exo-suit,” and “Gatling-gun outfitted,” J-Squad’s in a chopper armada like the one in “Avatar,” headed for the beaches of Normandy and “Operation Downfall.” Cage can’t figure how to get his guns off safety. It’s J-Squad haze-city for Mr. Slick. Boom! The chopper’s hit, they activate drop-wires, hit the beach, and in minutes—Cage is dead. And now begins the “Groundhog Day” portion of the movie. Cage wakes up, as if from a nightmare, cuffed, drill-sergeant excoriated, and about to endure J-Squad’s vitriol all over again. How’d he get here? Seems he got splatted on that first outing with “Alpha” alien blood, the DNA of which carries this time-reset capability. Sci-fi silly-science, but who cares? This is director Doug Liman of “The Bourne Identity.” Doug tells a mean story. He does just that. And finds out Rita had also been infected by an Alpha alien, which connected her to the Omega. The Omega would be commonly known in these types of movies as “The Queen.” Which gave her the same rapid reincarnation cycle. Then she had a blood transfusion. Then it all went away. So now they have to find the Omega by using the infection-caused visions that crop up in dreams of those carrying it. If you carry the DNA it can sense you, and you, it. Then you can go blast it and save humanity. What to do? First order of business is that Rita needs to whip cowardly Cage into shape. What ensues is a “Rocky”-type get-in-shape montage, with the added fun aspect being that when he falls short, gets injured, or whines, she blasts him (often over vehement protestation) back to Heathrow with a 9mm pistol, for a do-over. I know what you’re thinking. How’re the aliens? They’re good. Called “Mimics,” they’re sort of a cross between an octopus, the T2 Terminator, and a tumbleweed. They “purr” like tarantulas. They’re wicked fast. 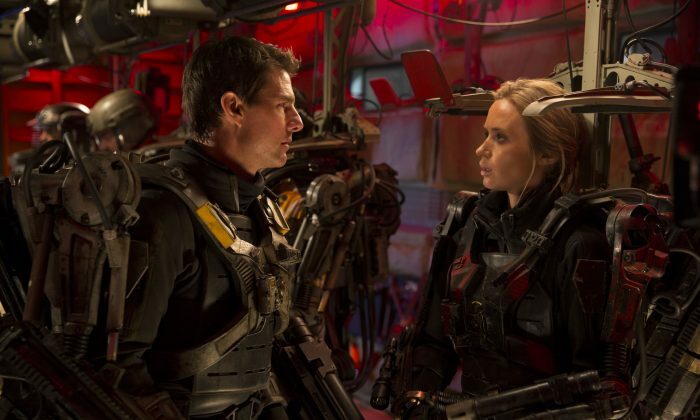 “Edge of Tomorrow” has four fun things. One, Cruise has played this slick salesman who grows a conscience before, in “Rain Man.” We underestimate Cruise. He got labeled a talentless pretty-boy early on, and then endured the he’s-weird-he-jumps-up-and-down-on-Oprah’s-couch thing, but few have noticed that the reason his movies have done so well for over 30 years is that he can, in fact, act very well. And he’s funny. Two, we already know Emily Blunt can act up a storm. Here, tanned, blonde, honed, and commanding, she looks every inch the major movie star. This project may see her carrying her own films soon. Three, you’d think a scene played over and over would get stale. Watching these two tackle the choreography involved in navigating a hallway filled with hostile personnel, probably needing upward of fifty “incarnations,” is fascinating. In this regard, “Edge of Tomorrow” is like a treasure hunt with fun surprises. Four, the romantic tension between the two stars is subdued but very palpable. He’s Cage, but she’s cagey, and needs many incarnations to get to know. This is where the parallels to the original “Groundhog Day” are most evident. Doug Liman has said that directing Tom Cruise made him a better filmmaker, and 'Edge of Tomorrow' could be the greatest project he has ever worked on.